"We entered the first part of the building and there was a huge whale reconstructed from the bones. It was impressive because it wasn't suspended in the air, you were walking next to it. After this we walked into the temple. The man working in the temple very nicely stopped the work he was doing to walk us through. We prayed at the alter, viewed the whale bones that were stored in the back, and he let us get up and close with the boats they were making. In a few weeks they were going to have a festival and release the boats onto the ocean. This man was in the process of making a third boat. They were beautiful and very detailed. Don't forget to admire the beautiful trees in the courtyard." The Van Thuy Tu Temple - is the largest and oldest whale temple in Phan Thiet. You will find not only skeletal remains of whales, but also fishing boats, rice hats, and authentic artifacts from the Nguyen dynasty. The temple was built in 1762 to commemorate Nam Hai (god of the Whales). The locals believe that benevolent whales are sacred animals, which protect fishermen against the bad weather and the dangers of the sea. Fishermen in Van Thuy Tu also catch 6-7 dead whales annually on the sea. After finding the course of the deayh, they bury the remains in a special cemetery in Ngoc Lan. After 3 years, the bones washed and taken to the temple. Ngoc Lan is located in front of the temple. Between the tombs you see a lot of flowers. Now this small temple houses skeletal remains of more than 500 whales, which are over 100 years old. 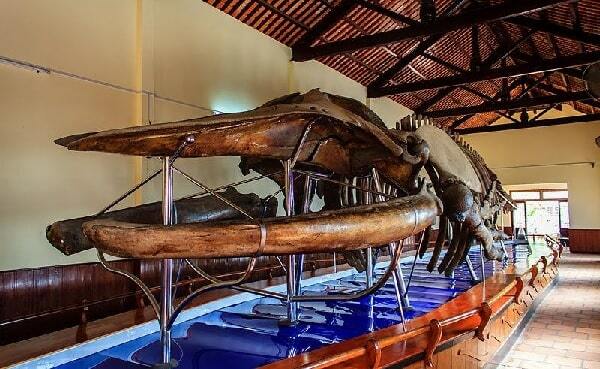 There is even a 18-meter whale skeleton, which it is claimed that it was the largest whale of Southeast Asia. Numerous artefacts from the Nguyen dynasty are exhibited in the main hall of the temple, as written resolutions of 24 former kings, little figures of terracotta, table with incense, painted wood and an antique bronze bell. In the temple are still held religious ceremonies every year, such as Spring Festival, Whale Worshipping Festival and Peace Prayer Ceremony. The locals try to pray to enforce some favors from the gods, as a rich fishing, calm sea and good weather. Visitors of the Van Thuy Tu Temple can also count on a wide range of activities including ceremonial rites, folk song and during boat races. Once the temple stood close to the sea with views to the east. The architecture is relatively simple and small, like other temples, but the temple has in numerous differences. 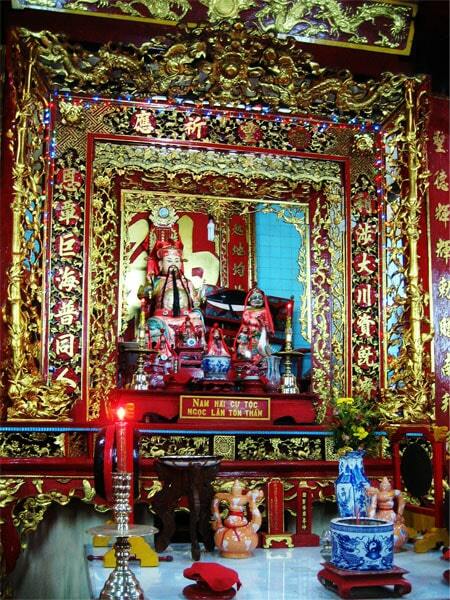 In the center is an altar with the image of God Nam Hai, you'll see on the left an image of "Thuy Long Thanh phi" (woman wins from the sea) and on the right "Thai Hieu ten su" (the ancestors). A visit is a "must" for history buffs and travelers who are looking for traditional Cham rituals. 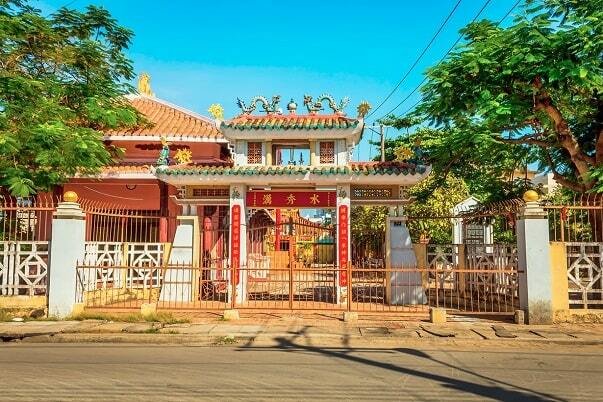 Van Thuy Tu Temple is 15 minutes away from the beach. Admission costs VND 10,000 per person which includes a tour of the temple. 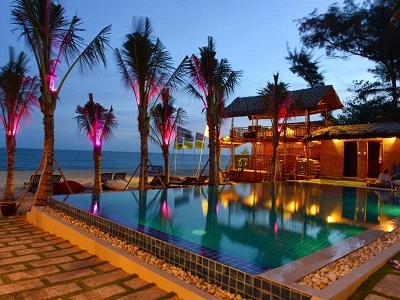 Ananda Resort is a completely renovated resort located in the middle of Mui Ne Beach. The resort was built in a unique fusion of traditional Balinese and Vietnamese architectural and design elements. All rooms are equipped with modern facilities like optical fiber Wi-Fi, flat-screen TVs with cable access to channels from around the world, an air conditioner, and a mini-bar. The vast tropical palm tree garden ensures a peaceful stay for guests, while shopping or dining venues are just a short stroll away. A large private beach with an integrated watersport center provides access to the South China Sea for watersport aficionados. Sunbathers can also relax at the resort’s state-of-the-art infinity pool which is right on the beach. Ananda Restaurant & Bar serves delicious European and Vietnamese cuisine, observing the highest standards of hygiene. Ananda Resort is ideal for single travelers, couples, or small families for both a memorable holiday in the tropics or a quick getaway to the beach.